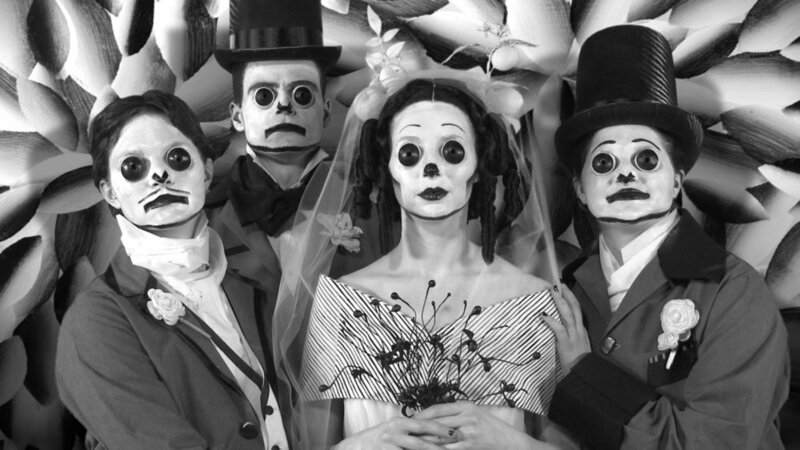 Mary Reid Kelley and Patrick Kelley are a husband-and-wife collaborative duo whose work collides video, performance, painting and writing. Their highly theatrical vignettes performed by the duo feature her scripts, painted sets and costumes and his videography and editing to explore gender, class, and social norms within history, art, and literature. The artists’ use wordplay, punning and rhyme as a humorous and incisive means of deconstructing how history is written and represented. Their short films focus on historical moments of social upheaval, often uncovering the stories and voices of historically underrepresented figures. Female protagonists such as nurses, prostitutes, and factory workers relate to their larger social histories through philosophical references, euphemisms and bawdy puns, all set within the parameters of rhyming verse. Mary Reid Kelley earned a BA from St. Olaf College and an MFA from Yale University. She is the recipient of the MacArthur Foundation Grant, has received awards from the American Academy in Rome, the Rema Hort Mann Foundation, and the College Art Association. Major exhibitions include Salt Lake Art Center, SITE Santa Fe, Institute of Contemporary Art in Boston, and ZKM Museum of Contemporary Art in Karlsruhe, Germany. Patrick Kelley earned a BFA from St. Olaf College and an MFA from Cranbrook Academy of Art. He has taught Photography, Video and New Media courses at the University of Minnesota, St. Olaf College, St. Mary’s College of Maryland, and Skidmore College in New York. His works have shown at the Bibliothèque Publique d’Information-Centre Pompidou, Paris, France, the Kunsthalle Düsseldorf, Germany, and the Minnesota Museum of American Art.